It's easy to tell if a crash was during transit or a speed section. 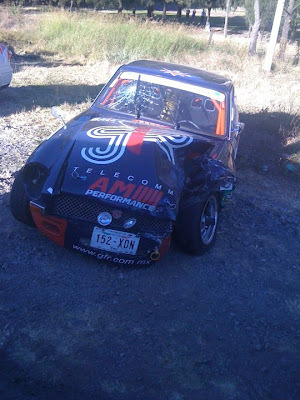 In this photo you can see where the head of the navigator in the Mexican MG racer hit the windshield. I don't know for a fact but it ressembles the lack of seat belts. This was the car that lost it's wheel on the track in Chiapas.